That was the motto of the National Lacrosse League in the summer of 2003. There were plenty of franchise shifts, all moving the league West. It started when Albany moved to San Jose, thus becoming the league's first-ever West Coast team. New Jersey followed about six weeks later in July by heading to Anaheim. Then Ottawa asked for a one-year suspension, and its players were scattered around the league in a dispersal draft. Buffalo took Jason Clark with its first pick. In August, the New York Saints suspended operations for a year after surviving since Year One in 1987. Their players were declared free agents. Finally, Columbus moved to Phoenix. Suddenly, the NLL had six teams in its Western Division and only four teams -- Buffalo, Philadelphia, Rochester and Toronto -- in the East. "Philadelphia, Rochester and Toronto have always given us a hard time," John Tavares said. "So on paper, things aren't looking too good for us. We're going to have to work hard to reverse that. ... But the one thing I really do like is that only one team from our division won't make the playoffs. That will increase all of our chances, from 1 in 6 in the West to 1 in 4 in our division." Back in Buffalo, coach Darris Kilgour was rewarded with a two-year contract that had a team option for a third year. The team's big move of the offseason was a trade that involved a player that never suited up in a Buffalo uniform. The Bandits sent Casey Powell along with forwards Marc Landriault and Nate Watkins, plus a second-round pick in 2003 for forward Neal Powless, goaltender Derek General, a first-round pick in 2003 and a first-rounder in 2005. "Since he's not playing in Buffalo, the greater good in me is actually happy to see him playing somewhere in the league," Bandits general manager Kurt Silcott said. "I think because Casey wasn't playing made a lot of U.S.-born players lean toward not playing in the league just for that reason." Buffalo used its top pick in the draft on A.J. Shannon of the University of Virginia. In December, the Bandits sent defenseman Andy Ogilvie to Vancouver for a first-round draft pick. The league's biggest drama came a few weeks before the start of the season, when the players and owners couldn't agree on a collective bargaining agreement. The two sides agreed to play under the terms of the old agreement for an extra year only days before the scheduled start of the season. The Bandits started their season with a win over old rival Rochester, 12-11, in HSBC Arena. The game was marked by one of the oddest finishes in team history. Rochester's Derek Malawsky scored just as the game ended. The goal was disallowed, prompting some water bottles to be thrown from the Knighthawks' bench. A review of the tape was inconclusive; it was said the goal came .01 seconds either before or after the end of the game -- too close to call. The controversial win was followed by two close losses -- to Philadelphia at home (ending a 10-game win streak in HSBC Arena) and Vancouver in overtime on the road. Buffalo finally got into gear with a 16-12 win in Anaheim, as it sparked a six-game winning streak. That included wins over Rochester and Toronto at home and in Philadelphia. That left the team's record at 7-2 and the team in first place, impressive even though regular goalie Steve Dietrich missed the last two games of the streak. He had injured his knee in the Toronto game. The Bandits came back to earth after that. Practically every game was close for the rest of the season, and Buffalo lost six out of seven of them. The skid started on Feb. 28 with a 13-12 overtime loss to Rochester in which the Bandits led for 57 minutes of play. "I had no big plan, I just shot it, let her rip," said ex-Bandit Shawn Williams, who scored the winner for the Knighthawks. Then followed a 13-11 loss to Toronto followed before the team's biggest home crowd in almost four years (10,599). The Bandits even tried a trade to shake things up, as they sent Ryan Powell and a draft choice to Anaheim for Roy Colsey -- back with the team after a short appearance in 2002. It didn't help as the team skidded to an 8-8 season after four straight losses. That record was barely good enough for a playoff spot. The final loss came by a 17-15 score to Philadelphia, and it cost the Bandits a first-round playoff game. "It's disgusting and I'm appalled," said forward Mark Steenhuis. "Guys have to get their heads on straight for the playoffs." The Bandits finished a game ahead of Rochester for the final postseason berth. No one could guess it at the start of the playoffs, but Buffalo was ready for a good-sized run. It started, surprisingly, in Rochester, a graveyard for the Bandits at time, on April 17. Buffalo scored the game's last six goals and came away with a 13-9 win. Steenhuis showed a hint of things to come with five goals; Jonas Derks had four. Dietrich finally looked like he was recovered from his groin injury in a fine performance. It was Buffalo's first win in Rochester in seven years. "I feel like [Masters champion] Phil Mickelson," said Bandits captain Rich Kilgour. "To win here and get that giant gorilla off our backs, it's just so sweet. Championships are more special, but this one ranks just a notch less." Then in Toronto on April 25, Buffalo had surprisingly little trouble in knocking off the first-place Rock, 19-10. Dietrich was the game MVP, while Derks and Shannon had four goals each and Tavares had two goals and seven assists. "We have a hungry bunch of dogs in here that are ready to fight and ready to win," said Bandits defenseman Kyle Couling. "Everybody had written us off after our slow finish [Buffalo lost six of its last seven in the regular season], said we were lucky with our 7-2 start, but we're for real. We proved it here today, we proved it in Rochester last week and now we need to prove it again in Calgary." That set up the title game and one last road trip, albeit a long one. Buffalo traveled across the continent to play Calgary on May 7. Their road magic finally ran out, as the Roughnecks took the title, 14-11, before 19,289. The Bandits went from a 4-1 lead to an 11-6 deficit, and couldn't rally from there. 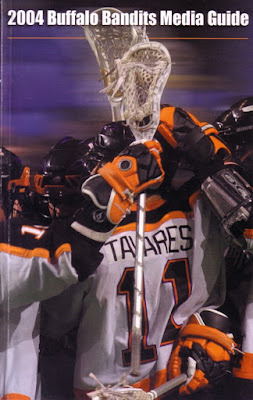 Tavares and Mike Accursi had three goals each. "[Calgary goalie Curtis Palidwor] made some really huge saves when we were within one, and that was the difference," said Darris Kilgour. "He stopped [Mark] Steenhuis on a fast break and [Jason] Clark on a really good opportunity. But it all boils down to the fact that we didn't play very good defense in the second and third quarters." "You can always look back and second guess but we played the cards we were dealt," Rich Kilgour said of the late-season fade. "I could have made a lot of money betting whether we'd make it to championship game because at the end of the season, nobody was giving us a chance." Tavares finished with 93 points to lead the team again, but there was plenty of balance on the score sheet. Accursi, Derks and Steenhuis all had at least 24 goals, while Clark and Crosbie were in double figures. It was a rather schizophrenic season, but the playoff run did show that the Bandits were one of the elite teams in the league when healthy and playing well.